Gimme skinny: Shopaholic no more! Lately I have been majorly decluttering and getting rid of excess stuff around the house. Aside from the things we donate, I still had a few things that I spent a pretty penny on that didn't get much use. 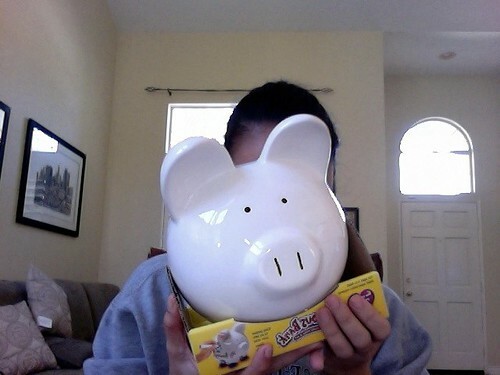 Well, thanks to Craigslist and ebay, my piggy bank is oinking like a maniac. Kitchenaid mixer and pasta roller attachments. Omg used like 3 times or less, pasta rollers once. Nikon zoom lens - yeah, never used. I had to dig around to find it. It was in a drawer with clothes that I barely use. LESSON LEARNED: Think before buying. I guess I've made some stupid impulse purchases over the past year or so. It's really sad that I had these things laying around my house and garage that went totally neglected. I still have oodles of crap. Stamping and scrapbooking supplies (not just supplies, I could seriously host a workshop for at least 10 people with the amount of stuff I have for this), knitting and crochet materials. Not sure what else, as I've done a good job of donating, tossing and selling stuff off. I am dead at "OINK OINK." You and J are so much alike. You find a hobby and spends tons on it and then lose interest a week later. LOL. Glad you were able to recoup some of the money at least by selling them. I wish I had already decided I wanted a Wii when you were selling it on CL! :) Good job on selling everything, declutterizing (I know that's not a word)is always a good thing! damn, dude. i wish you'd have put a call out before you got rid of that kitchenaid and attachments. So when will all of the dolls go? The dolls will NEVER go! lol. Ditto wan re: Mixer :-/ I MAKE CAKES DAMN IT! ditto wan re: attachments - I want those!!! GRRRRR!!!! ditto fgd. and i'm jealous of whomever got your mixer. wah. Dude, why did you tell us before you sold the Kitchenaid??? I would have wanted it too. dammit! i want the kitchen aid mixer!